Middle East (MNN) – The refugee crisis has been so discussed, so dissected, and so politicized that the real subject behind the issue is often forgotten. More specifically, we have forgotten that refugees are more than just victims of war and violence. 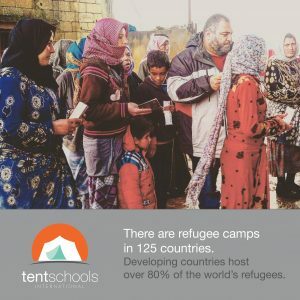 Tent Schools International is one group face-to-face with refugees every day. And as they work to meet the various needs of people who have fled dangerous situations at home, they begin to learn their stories. There’s another attitude: fear. How will accepting refugees into our country change our lives? One of these aspects was recently brought to light in a study done by Talent Beyond Boundaries. Dieleman explains, “They conducted a study between July 12 and August 15 of this year in Lebanon and Jordan, interviewing refugees of all [nationalities]—mostly Syrian but also from other countries, Iran, Iraq, etc. And they were able to collect out of thousands of interviews over 9,685 profiles during that time. Many of the interviewees had post-secondary education. Because of the tendency to only view refugees as victims, we might find the results surprising. Instead of a doctor, we see a broken man with nothing. Instead of a professor, we see a woman who survived but is still struggling to keep her family alive. We see need without potential. Among the people the group interviewed, they found “engineers, business administrators, educators, information technology experts, people who are experts in law, accounting, languages, computer science. Over 80%, for example, of these professional level people have some level of proficiency, either professional or functional… in English,” Dieleman says. And just as they were an asset in their home country, they will have a lot to offer whatever society they become a part of going forward. For now, their lives have been put on hold. Some nations have already caught on to this idea and are finding ways to integrate refugees into their society. Dieleman says the study also pointed out that a large portion, 40 percent, of employers worldwide are having trouble filling professional positions with qualified people. But even more than someone with something to offer, Dieleman reminds followers of Christ that these people are valuable simply because of who created them. There are a number of ways you can plug into this story. One of the ways is to walk with Tent Schools as they meet the changing needs of these people and make sure they’re helping for the future. Tent Schools International is helping by providing education wherever children are. They also help to connect families with technology and technology training. Additionally, they’re working with partners who are resettling refugees to help provide them with the technological tools they might need to get a jumpstart at starting their life over again. Not only are they helping the next generation see the potential for their futures, but they’re helping the world see the God-given value these people have. If you’d like to join them in this effort, click here.